Absolutely pretty and fair educated daughter below 28 from a decent family is sought by B/​G father Engineer and mother retired teacher closer to Colombo for their handsome son IT Engineer living in US born 1984,​5’10”. Differences immaterial. Reply with T.P. number. E-mail: r​a​d​a​k​a​r​u​@​y​a​h​o​o​.​c​o​m​T.P. 0112789844. An educated pretty daughter is sought by respectable G/​B parents in USA for a son 38,​5’9”,​educated and handsome,​holding a high position,​legally divorced and has a child living with the mother. All religions are welcome. Please reply with horoscope & family details to Email: m​e​n​i​k​h​e​w​a​@​h​o​t​m​a​i​l​.​c​o​m​Tel: 1 949 354 1966,​0112898496. Born 1973 well established groom looking for partner age caste immaterial divorcee & overseas partner considered. a​r​j​u​n​a​l​l​k​@​o​u​t​l​o​o​k​.​c​o​m​011 7902856. B/​G 39 (1979 Sep),​divorced with 2 beautiful kids (girl 6 boy 8 shared custody),​height 5’8’’ and athletic build. IT Engineer works in a reputable IT firm in Sydney Australia (citizen) is looking for an educated girl for marriage. Divorcees without kids also can apply. Must be under 35 years old. Please reply with family details to a​u​s​p​r​o​p​o​s​a​l​s​y​d​n​e​y​@​g​m​a​i​l​.​c​o​m​As a Buddhist I do not believe in horoscopes but I can provide mine. Caste/​religion immaterial. Colombo GB parents seek educated working Executive pretty qualified daughter for handsome son 5’4”,​29 yrs.,​educated abroad with Masters working Executive reputed Firm well off salary. Reply horoscope t​a​r​i​n​@​l​i​v​e​.​c​o​m​Thula Lagna Siyawasa Nekatha Raaksha Gana. Moor parents seek a professionally qualified bride for their 33 years old son. Who graduated in Computer Science in England. Currently working as Assistant Manager in a reputed media firm back in Sri Lanka. Should be a qualified professional. Moor preferred. Brides settled abroad are most welcome. Please reply with details at h​i​j​a​z​a​h​a​m​e​d​1​1​@​g​m​a​i​l​.​c​o​m​or call 081 2387356. 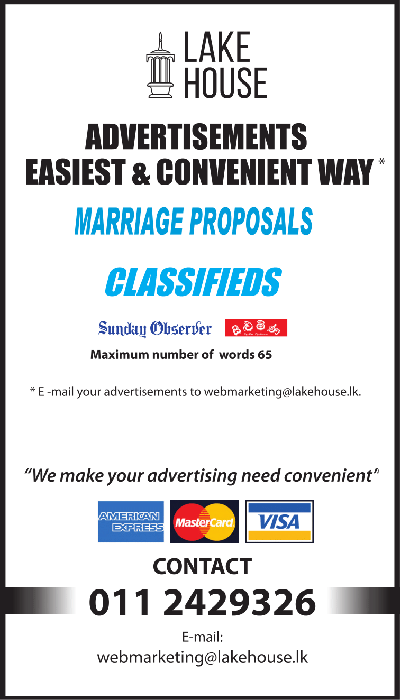 Sinhala Christian mother from Colombo seeks a pretty,​educated,​Christian daughter for their 1975 born son. He is a manager at a foreign bank with academic and professional qualifications. He is 5’7” in height,​never been married with sober habits. Please reply with family details to: m​a​r​p​r​o​3​3​3​3​@​g​m​a​i​l​.​c​o​m​or contact on 011 2865115. Divorcees may not reply. Well-mannered smart partner 5’10” seek fun loving companion in view to marriage. No differences. Confidentiality assured and expected. p​r​a​d​e​e​p​d​i​a​s​s​e​n​e​v​i​r​a​t​n​e​@​g​m​a​i​l​.​c​o​m​. Write with contact number.